Caught by a powerful lord from the alternate realm of Arkavia, Taya's offered the chance to avenge the dead, save her home world, and win her freedom. Her days of stealing supplies and surviving among the remnants of Earth are over, but can she afford the price of Lord Thane's deal? Taya is the only survivor in her group when the Blue Wave hits and she watches her friends disappear right in front of her. She swore vengeance. Now she just has to figure out what happened, why it's happening and make the bad guys pay. But there are men on horseback wearing armor and rounding up survivors. She'll need all the skills she ever learned just to live. And there is more involved with the men on horseback than she can ever imagine and when she is captured and taken with them she uses this as a way to continue getting her revenge. But she's more than a prisoner and she'll find there is more to the disappearance of her friends that she can ever imagine and she's an integral part of the whole story. Great book. I was waiting eagerly for it and it did not disappoint. There is action and romance and sword fights and evil wizards - yes it all works. I was going to read half one evening and the other half the next night - unfortunately, I was unable to put it down. I did try---I put it down and turned off the lights and 10 minutes later I was reading" just one more chapter" until it was finished. My recommendation is don't miss this book, it's a ton of fun, but plan enough time to read it in one setting. (I voluntarily reviewed an ARC). The Night House is a captivating story filled with action, adventure, romance and magic! The characters are in depth and the world building so descriptive that I could easily picture the story taking place as I read. I quickly became invested in Taya and her journey and found it hard to put this book down. Any time there’s a sword on a book cover, I’m interested. But when the main character is a woman with two swords made of lightning and dressed like an assassin? Then top it off with J.C.’s martial arts background? Well, I knew I was in for a great story with some awesome action. Going in, I wasn’t sure if it would lean more toward sci-fi or fantasy, but it was a surprisingly unique mix of both, and even though I’m not much into sci-fi, I loved the world setup in Night House. Taya, as I had hoped, was a strong protagonist who is intent on surviving a reaping of Earth by the alternate realm of Arkavia. Arkavia doesn’t have enough resources, so they have their own survival in mind, and they do it by wiping out technology and most of the population with what Taya calls “the Blue Wave of Death” before going in and sacking the planet. And that’s how Taya meets Lord Thane. Needless to say, Taya holds a lot of hostility toward the Arkavians, but when Lord Thane presents her with an offer that will increase her chances of survival, she’s smart enough to control her hatred and take it. Dead girls can’t take revenge, right? One thing I loved about the story, though, is we don’t long stay trapped in Taya’s hatred. As much as she resents what the Arkavians have done, the timeline fast forwards through some of her adjustment period, just enough to minimize the wallowing and realize that the Arkavians are as human as she is underneath their strength and super-powers. And Thane is a good, honorable guy dealing the best he can with some terrible scars from his childhood and the world he belongs to. I loved Thane and his band of guys, how they accepted Taya into their group, and the banter between them all. Taya is someone I’d totally hang out with – she’s snarky and tough, smart and funny, and makes her fair share of mistakes as she’s finding her way. Did I mention lightning swords? Lightning swords, people! The Arkavian world was also fun to explore and discover with Taya, and the sparks between Thane and Taya were just right. 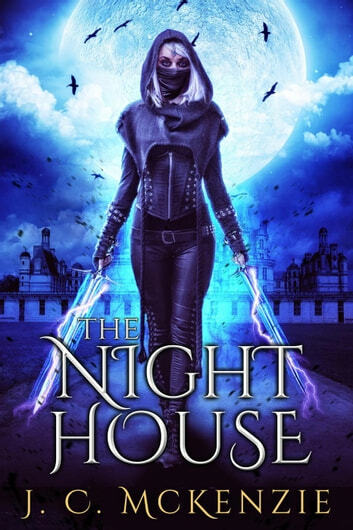 If you like awesome fight scenes, a heroine who perseveres through whatever is thrown her way, and a slow-burn romance that keeps things steamy, The Night House is a must read. I received an ARC of The Night House for free and this review is completely my own (glowing) opinion. A mysterious blue wave of magic rolls across the earth killing almost everyone. With well-honed fighting skills and survival instincts, Taya stays alive. She learns that warriors have come from another dimension to reap the world of its resources. They are called Arkavians. She calls them, “ … a civilization of good-looking locusts.” Thane, a member of the royalty in Arkavia, is attracted to Taya’s Arkavian-like features, integrity and personal power. Using a non-permanent, magical bond he ensures her service for a year as his bodyguard On the first day of the invasion she promised herself that she would avenge the death of her friends, but as she spends time with Thane her feelings become complicated. “Guilt stabbed at her chest. Guilt for surviving. Guilt for living among the enemy and not trying to slit their necks at every opportunity. Guilt for actually liking the men on Thane’s team and guilt for … guilt for Thane.” Taya struggles with her feelings as she helps Thane uncover layers of betrayal in his elite society and the true history of the portal connecting their realms. This book is truly a flashlight-worthy read. J.C. McKenzie pulled me into the story on the first page and never let me go. There’s lots of plot, lots of action and hot romance coiled with emotion. Taya is easy to relate to and Thane is a memorable hero with a heart of gold and a body of steel. While the fight scenes are detailed and emotion-driven, McKenzie’s trademark humor lightens the darkness to create a well-balanced tone of adventure, love, and fantasy. I highly recommend this book for readers who enjoy post-apocalyptic stories, or paranormal romance. This standalone fantasy romance is an exhilarating and stunning read that readers can’t put down! The characters are powerfully strong and demand attention from the very beginning and readers won’t be able to get enough as their romance burns slowly getting hotter and hotter which works great for this brilliant and creative world. The story is kind of an alter-realm invasion story that masterfully blends familiar story elements with unique elements in a bubbling cauldron of intensely suspenseful & emotionally gripping events while the setting of which is a sort of a historical world full of magic adds to the ambiance of the story although the story can’t really be labeled as historical because it feels more like a futuristic or apocalyptic setting. The fast pace ensures that readers never have a chance to become bored and steadily builds adrenaline pumping expectation throughout the story as Taya and Thane strive to uncover the culprit behind a magical conspiracy. While the romance may not be the biggest part of this story, there is an HEA and readers can’t help but be awed by the female heroine, magic filled swords and the gratifying blend of elements that makes a wonderfully entertaining reading experience.